Guindy National Park, probably the smallest national park in the country is located within the city limits of Chennai, the capital of Tamil Nadu. The park with an area of 2.82 sq. km has a strong historical background. Originally a game reserve of 400 hectares, it was owned by Gilbert Rodericks, a British citizen. When Gilbert died, in 1821 the Tamil Nadu government purchased it and the surrounding wooded property for a sum of Rs. 35,000/. The place was declared as reserved forests in 1910. 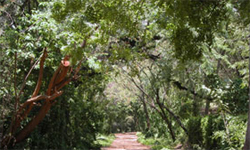 The then Prime Minister Jawaharlal Nehru allotted a portion of the Guindy forest as a park for children. In 1958, it was handed over to the Forest department and in 1978 the entire forest area was declared as Guindy national park. Guindy National park consists of various vegetation zones mainly tropical dry evergreen flora with over 350 species of plants�including trees, shrubs, climbers, herbs and grasses. 24 varieties of trees including Amona Squamosa, Atlanta Monoplylla, Feronia Limonia, Azadirachta�India and many others are found in this park. The animals found here include spotted deer, black bucks (also known as Rare Indian Antelope found only in India), white bucks, river otter, hyena, bonnet monkey, civet cat, jackals, pangolin, hedgehog and common mongoose.� Birds which can be seen here are the black winged kite, the buzzard, olden Backed Woodpecker, Crow Pheasant, Yellow Wattled Lapwing, Red Wattled Lapwing, Blue Faced Malkoha, Shrikes, Koels, pariah kite, Minivets, Munias, Barkets, Parakeets, Grey Partridge, Tailor Birds, Robins, Drongos, Quails, Beak Paradise, Flycatcher, Stone Curlew and so on. The Children's Park here has playgrounds, swings, mini-railway, elephant and pony rides (weekends) etc for the kids. There is also a mini zoo with a sizeable collection of birds, deer's, peacocks etc. which gained statutory recognition as a medium zoo from the Central Zoo Authority in 1995. In addition there is a Snake Park established in 1972 with king cobras, pythons, vipers etc. Apart from snakes, certain species of tortoise and turtles- especially the endangered star turtle can be found here. There are also lizards, geckos, chameleons and the common Indian monitor lizard, as well as a large variety of insects and butterflies. Raj Bhavan, the Governor's residence occupies one of the corners of the park. The beautiful forest area continues to the adjacent campus of the famous Indian Institute of Technology. Surrounding the park there are several other famous institutes such as the Anna University of Technology, Central Leather Research Institute, Cancer Institute and the Chennai race course. There are also memorials to India's great leaders, Mahatma Gandhi, K.Kamaraj and C.Rajagopalachari, Bakthavatchalam in the vicinity. The park organizes Lecture-demonstrations regularly in languages like Tamil, Hindi and English. Though the park itself offers nothing much for a real wildlife enthusiast, the Snake Park is interesting. The park sums up a favourite picnic destination for the entire family especially school going children. Timings: 9.00 am, to 5.30 p.m. Holiday: Tuesday. Entry Fee :Below 10 years - Free, 11 to above Rs.5/-, School Children (Age 5 to 12 years) from Government and aided Schools - Rs.2.00, School Children from Private Schools (Age 5 to 12 years) - Rs.10.00. Adult : 15.00.